Laura Timmel saw signs early on that her son, Reed, had developmental delays and mobility challenges. He was not progressing like other children his age. By the time he was ten months old he started physical therapy and just before his third birthday, Reed was diagnosed with a condition known as Spino Cerebellar Ataxia #8. This condition impacts Reed’s core strength, which leads to global delays including fine and gross motor skills. Reed’s therapy increased to five times a week and soon the only way he could walk was with the assistance of a walker. Laura worked with students with disabilities in a previous job which helped her realize that some type of animal therapy could help her son. She consulted his doctor who agreed. She was introduced to Ray Graham Association’s Therapeutic Horsemanship Program when Reed was almost five years old. The program operates out of the Hanson Center, a 12-acre, PATH Intl (Professional Association of Therapeutic Horsemanship International) accredited facility nestled in Burr Ridge featuring 20 therapy horses, a heated indoor riding facility, riding trails and an outdoor arena. Reed was enrolled in private. Each time he went to a lesson he appeared to get physically stronger. Less than four months after he began lessons with the Therapeutic Horsemanship Program, Reed no longer needed his walker. His muscle tone had drastically improved and his sense of confidence was bursting. “He was walking so fast that it was almost dangerous for him to use a walker,” explained Timmel. Today, Reed is seven years old, and while he is still unable to speak, his social and emotional development is age appropriate. Timmel believes the program changed her son’s life. It not only helped him walk independently, but it changed his demeanor. 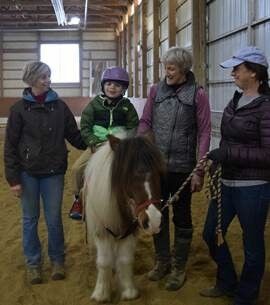 He looks forward to his riding lessons and engaging with the other children who benefit from the program. For more information about Ray Graham Association’s Therapeutic Horsemanship Program at the Hanson Center, call 630- 620-2222 Ray Graham Association supports nearly 2,000 children and adults with disabilities, and their families, through residential, life skills, employment, recreational and family support services. Visit raygraham.org.